It’s a splitter battle in Anaheim as two right-handers with excellent split-fingered fastballs and relatively poor uh, regular fastballs face off. Both are known for great control, an ability to miss bats, and home run problems. Iwakuma’s been the better, more consistent, pitcher over his big league tenure, as he’s tended to suppress BABIP and strand runners, meaning his ERA’s been consistently below his still-pretty-decent- FIP. Shoemaker, on the other hand, has under-pitched his peripherals by a bit, as he’s running a career ERA a bit higher than his FIP. A big part of Shoemaker’s seeming inconsistency has been his troubles away from his home park. On the road, he has a career FIP of 4.42 and ERA of 4.91, compared to home marks of 3.06 and 2.79, respectively. It seems like we’ve been wondering what sort of devil magic the Angels cook up at home, but it’s worked for Shoemaker: not only are is HRs suppressed (and as that’s his biggest weakness, that’s a huge factor), but his K-BB% is much better as well. He’s a pitch to contact control arm on the road, but a high-K, low-HR near-ace in Anaheim. Also of note is that he’s run reverse platoon splits over the years, and they’re freakishly wide this year. I’m not saying his 2016 are his true talent, but this is not a guy you’d automatically put out your left-handed batting line-up against. It’s odd, because he strikes out more righties, but righties seem better able to capitalize on Shoemaker’s mistakes. Righties have a higher HR rate despite hitting fewer fly balls. I can see why managers might not trust what’s essentially a HR/FB oddity, but there may be more to it: righties are hitting Shoemaker’s third pitch, his slider, fairly hard. Even more similarities with Iwakuma! As you can see, the M’s playoff odds have improved markedly since late July, rising from a low of around 11% to the current ~40% in a matter of a few weeks. That’s good, and the M’s played well in that stretch, but…holy crap, look at the Astros. There own odds have cratered, falling from over *69%* in late July to 8.5%. They’ve shaved over 60 percentage points from their playoff odds in a matter of less than three weeks. That’s kind of astonishing. They had a four-game winning streak a week ago! 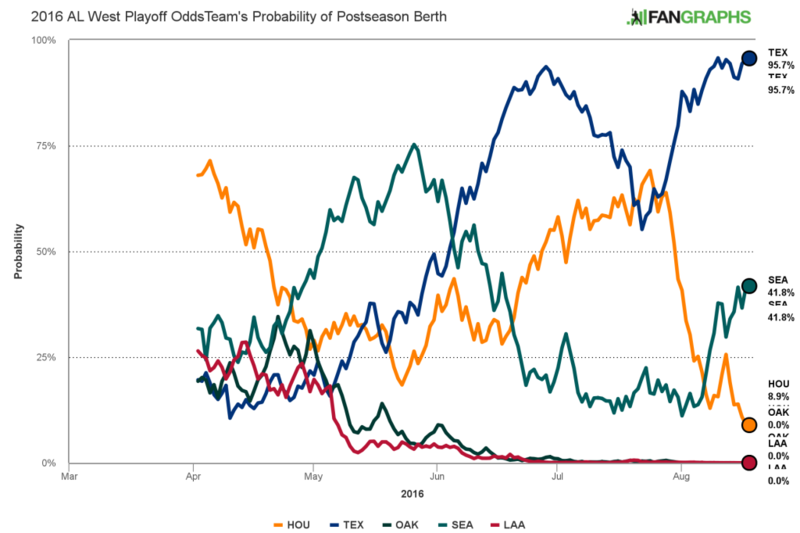 Part of this is due to the fact that both Seattle and Texas have been incredibly hot, so that even when Houston won, they couldn’t really gain ground. But the bigger factor has been that nearly every loss they’ve had has been to a wild card rival. They’ve dropped 5 of 6 to Toronto in recent weeks, and they got swept by the Tigers. Overall, Houston’s a decent hitting club, and their pitching hasn’t been too bad, despite a down year from Dallas Keuchel. There’s no big sequencing issue here, as their baseruns record is almost exactly the same as their real one. Last year’s bullpen collapse hasn’t repeated itself, as their club has a very good WPA. Instead, they’re suffering from some sort of weird meta-sequencing. The distribution of runs matches their record, but the distribution of their losses has sunk them. Clearly, no matter how they got to 61-59, they’d be in the same position today. But their season’s been so bizarre, so streaky, that it’s like they were designed to produce huge spikes in playoff odds. A big part of *that* has been their inability to coax much value from their vaunted prospects like AJ Reed and Alex Bregman. No one could’ve foreseen Carlos Gomez’s collapse, or Dallas Keuchel’s (really) down year, but they were supposed to have depth to cover over whatever holes developed. Instead, when Tyler White faltered, Reed faltered *worse*. After dominating the minors, Bregman’s taking a while to adjust to big league pitching. A year after getting a huge lift from Carlos Correa, the Astros player development machine has given them some good Joe Musgrove starts and not much else. Meanwhile, the Athletics not only have to deal with having the worst group of position players in MLB by fWAR, but also the festering conflict with erstwhile star and team leader, Coco Crisp. Crisp’s been hurt, and he hasn’t had a season above (or even near) league average since 2013, so it’s pretty natural that the A’s would scale back his playing time in favor of some young hitters. But Crisp’s got an option that vests if he plays in a certain number of games, and given his PT now, it looks like he’ll fall just short. If there’s one team that really needs to avoid paying out a player option for a declining vet, it’s the A’s; to many, this’ll be a vindication of their trade-early, trade-often philosophy – that trading, say, Josh Reddick before he becomes an albatross is the way to go, even if you have to suffer a Josh Donaldson or two. But the A’s can’t *just* be worried about their 2017 payroll. Given Donaldson and Reddick AND a string of poor seasons, their fans may be weary of rooting for a club whose operations make it virtually impossible to have a favorite player. Moreover, they may make it even less likely that free agents will want to sign with them. Won’t their prospects look at Crisp’s comments when they’re presented with contract extensions? The M’s and A’s AAA farm teams meet up today as well, as Taijuan Walker faces off with the A’s top AAA starter, Daniel Mengden. Mengden made 9 lackluster starts in MLB, but has been really tough to hit in AAA. Other starters include Andrew Moore going up against Birmingham, Ronald Dominguez facing Quad Cities, and Eddie Campbell pitching against San Jose. The Coco Crisp situation will be monitored closely by veterans, and agents alike, and cause Oakland to be on many no-trade lists for many future contracts. In the A’s defense, they are probably on a ton of no-trade lists to begin with. The Mariners are 16-6 when O’Malley starts at shortstop. Yeah, I always go to bed early. I understand I missed a great ending last night. What a play by Seager. Nice pick by Dae Ho kind of got overlooked too. As for O’Malley, mostly random chance I suppose, but certainly the team does not suffer with O’Malley at short. Fangraphs says he has been the better player in fact. And Brad Miller has been way better than either of them. There are plenty worse places to spend a summer than Northern California. I thought Oakland was on the up and up now. O.co is still a cesspool but the city itself is supposed to be turning it around. You could easily live in San Francisco and work in Oakland. Can we wrap up the Nick Vincent experiment? He’s looked horrible the last two nights. A split with the lowly Angels is not ideal. Disappointing. Zunino comeback player of the year. 4-3 roadtrip vs Oakland & California? Need to do much better the next homestand. Sooo….can Nick Vincent not be used for a while? Regardless of the loss… I am so happy that the Mariners seem to have “fixed” Zunino. I felt so bad for the guy (and so bad for us while we had to watch him before). I worried that Jack Z had irretrievably broken him – but it appears not!